African American ragtime musician James Scott, who spent his formative years in Carthage, Missouri, entertained crowds at Lakeside Park, just outside Joplin. 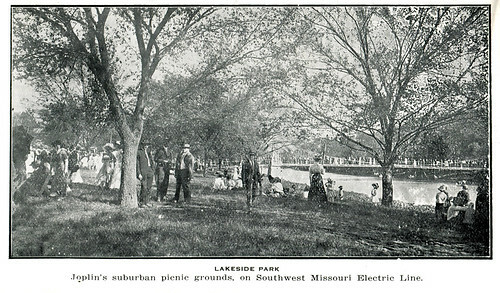 In 1914, Scott wrote music for a song he called, “Take Me Out to Lakeside.” The words are by Ida Miller. Oh come and dance with me. A glorious thought it seems. To listen to a sample of the song, visit this link at Pandora Radio. The Powers Museum of Carthage needs your help. Recently, the museum’s air condition system had a near catastrophic failure. The result is that only the main gallery and library are receiving air conditioning, while the storage area of the museum, home to many of the museum’s most valuable and climate sensitive items, is not. As noted in the above linked Joplin Globe article, never in the museum’s 24 years has it requested public help, but the cost of replacing the faltering system is more than the museum’s usual sources of funding can support. Repairs are not an option, unfortunately, as the company which makes the needed parts is now out of business. If you have never been to the Powers Museum, it is definitely worth a visit and a fine example of what a local history museum should be. Please show your support for local history and make whatever donation you can to help preserve Jasper County’s history. For those of you who missed the announcement in last Sunday’s Globe, it was announced that the Carthage Historic Preservation, Inc., will be running a historic home tour next month (click on the link for descriptions of the featured homes). The tour will run from 10 am to 4pm on December 4th for a price of $20 at the door, but buying a ticket in advance will save you $5. A tea will also be available for $6, and Christmas/Winter themed paintings by regional artists will be available for purchase. It’s a great chance to enjoy history quite literally from the inside out. For those of you who love turn of the century homes and just don’t get the chance to visit them often enough, next Saturday will be an opportunity not to be missed. We previously mentioned the impending opening of the traveling Lee – Grant Exhibit, but wanted to bring to attention some coverage of it by the Joplin Globe. The article includes a nice list of events happening in relation to the exhibit such as lectures, and reminds us, the exhibit is only around until the 20th of this month! Also touched upon is Amanda Shurlds, the wife of General Grant’s brother-in-law. With the impending 150th anniversary of the Civil War about to begin next year, now is the time to refresh yourself with the generals who helped brought about the war’s end. A portait of Lee via Wikipedia. The much talked about Lee & Grant traveling exhibit will be opening September 1st at the Powers Museum in Carthage. The exhibit features,”a major reassessment of the lives, careers, and historical impact of Civil War generals Robert E. Lee and Ulysses S. Grant.” Furthermore, the exhibit, “encourages audiences to move beyond the traditional mythology of both men and rediscover them within the context of their own time — based on their own words and those of their contemporaries.” To do this, the exhibit uses a great variety of items, such as photographs, paintings, accouterments, coins, prints, and reproduction clothing. Also used are documents written by each of the famous generals. Unknown to many, Julia Grant, Ulysses’ wife, had relatives who lived in Carthage, which created a connection to the Jasper County city and the Grants. Lee also has a connection to Missouri, where while in service with the Corps of Engineers, he helped to prevent the Mississippi from flowing away from the bustling city of St. Louis. For a sneak peak of the exhibit, check out this link on the exhibit from the National Endowment For the Humanities. Of course, available all year round is the Powers Museum, a great place for local history. Although he was a citizen of Carthage, Charles Wild’s story is worth mentioning on Historic Joplin. As a young boy growing up in Sarcoxie, Wild suffered a bout of scarlet fever. He was left crippled and unable to walk. Wild, however, was undeterred. Although he could not play baseball or swim in a country stream, Charles Wild focused on his studies. It was said that as a mere boy he took over as the bookkeeper and business assistant in his father’s nursery in Sarcoxie. Later, when he was older, Charles attended St. Louis Law School (now called St. Louis University). After graduation he opened a successful law practice in St. Louis before he returned to Sarcoxie in 1906 and became the law partner of H.T. Harrison of Carthage. 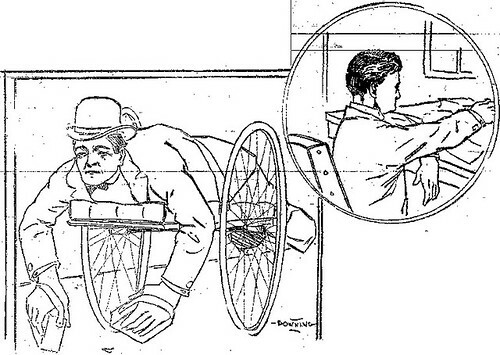 A sketch of Mr. Wild in his cart, as well seated at a table. Wild could travel faster than the average pedestrian unless there was snow on the ground when “it is almost impossible for him to make any progress.” In addition, “rough roads and in wet and muddy weather” were a hindrance. Wild, it was noted, “was respected by everyone, a friend to whom one can go in time of need, he is not only one of the most able but one of the most beloved men in Carthage.” He depended “upon his own abilities for making his way in the world” and he certainly did. While Joplin did not have a professional baseball team until around 1901 / 1902 in the form of the Joplin Colts (who became the Miners), amateur teams were active and present before then. Among them was this African American team called the Joplin Shadies. Unfortunately for the Joplin team, on July 30, 1896, they lost to a Carthage team. A brief score from Joplin's African American baseball team in 1896. This page took 0.383 seconds of computer labor to produce.